Have you ever noticed how birdfeeders put out the welcome mat for our fine-feathered friends? Picture yourself, walking or driving past a house and you see an assortment of birds gathering in its backyard. This may very well be the result of a carefully chosen birdfeeder. 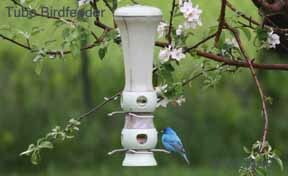 There is no other sure way to attract birds quite like, a well-placed birdfeeder or birdfeeders, depending on the amount or variety of birds you wish to attract. You will likely see a greater variety of birds by putting out more than one birdfeeder filled with different types of birdseed. There are many different models of birdfeeders and choosing one model over the other will help in the type of birds you will attract. 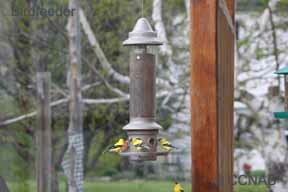 Here is a list of the more common birdfeeders to be found on the market today or constructed at home, with some helpful notes specific to each. These models of feeders use the principles of weight or leverage to prevent the larger birds and squirrels from accessing the food. Some models, such as the one pictured, use an adjustable spring unit to close the ports to the bird food when a certain size bird or squirrel attempts to rest on the perch and access the feed. Another model has a teetering perch which works by the same principle. When a heavier bird or squirrel tries to rest on the platform, the platform will teeter, closing access to the food. 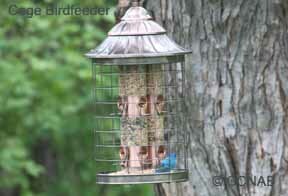 These feeder styles work best only when the unwanted guest uses the perches. The birdfeeders must be hung in a manner that will not allow it access to the food through another make-do perch. The caged birdfeeder design has a wire mesh surrounding the entrances to the feeding stations, preventing larger birds, squirrels and even deer from accessing the bird food. Although these cage designs do work to a certain degree, each aforementioned animal's ingenuities and determination often result accessing a portion of the feed. At best, these cages will make it difficult for larger animals to reach the feed, giving the smaller birds more opportunities to feed at the station. 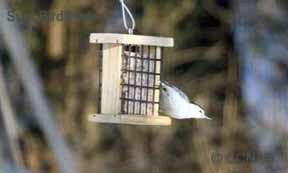 Suet Feeders are available in stores or can be a simple homemade product. Suet cakes can be purchased commercially with their size and dimensions already calculated to fit in standard size wire mesh suet birdfeeders. Suet cakes can be purchased at any store that sells birding supplies. Suet cakes can also be created from recycled onion sacks or store-bought plastic bags, filled with homemade suet made from beef fat. When making homemade suet, you can mix in your own ingredients by adding different types of birdseeds, peanuts, cracked corn kernels along with the fat before it hardens. Whether store-bought or homemade, by hanging the suet from a tree limb or pole, woodpeckers, chickadees, nuthatches, jays, titmice and the ever so aggressive starlings will be attracted to it and become a regular everyday guest at your feeders. Whether in the shape of a tube or square, these bird feeders are designed with multiple access points and perches often placed one above the other. 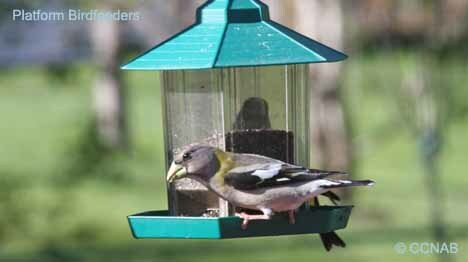 The small holes in the sides of the bird feeder, allow birds to easily access the seed. These holes can be small enough for millet and niger seeds or made larger to accommodate larger seeds such as sunflower or possibly cracked corn and shelled peanuts. This style of feeder attracts finches, redpolls, siskins, goldfinches and Chipping Sparrows. 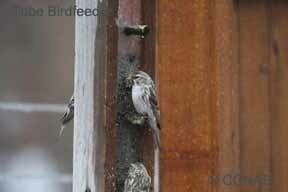 Unfortunately, this style also has its faults due to the birds on the upper perches becoming gradually unable to reach the feed due to the birds below lowering the feed volume of feed. This results in the birds on the lowest perches to be the only ones able to eat. As opposed to most bird feeders, which have bird visitors in the Spring and Fall, the hummingbird feeders get their highest traffic, starting in late Spring and lasting throughout the summer. Homemade syrup can be readily made, by mixing 1 cup of white sugar with 4 cups of water. It is not recommended, that a red food colouring be added to the mix. It is however better to purchase a feeder that has a coloured body, red being the better choice. The amount of syrup that is placed within a birdfeeder depends on the temperature and the location of the feeder(s). The syrup should be changed every few days or when the contents turn cloudy. Hanging the feeder in a shady area will preserve the syrup longer as opposed to direct sunlight. 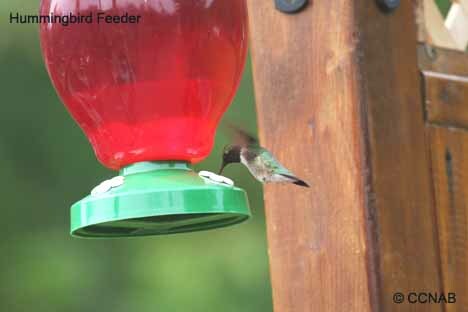 It is said that hummingbirds will not use a feeder with older or cloudy looking syrup. 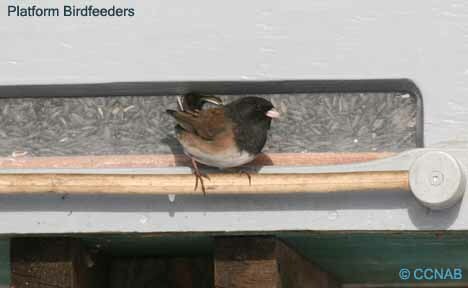 The feeder should be cleaned every week or less, again depending on the temperatures. If a black mold should become present, it can be removed by the use of bleach, though make sure to rinse the feeder properly with water before refilling it with syrup. Selecting a hummingbird feeder, that has red plastic flowers spouts, seems to work best in attracting the birds. The hummingbirds are very protective of their feeders and will not share with other hummingbirds. Installing more feeders in different areas of your property will attract a greater number of hummingbirds. With every hummingbird feeder, comes the ants. These determined little creatures will find the feeder and do their utmost to find a way to reach the syrup. There are specially designed bowls that can be attached to the supporting wire of the feeder that will not allow the ants to travel any farther down the wire. Another uninvited guest will be the hornet in August. With a sufficient number of hornets, the hummingbird may very well stop visiting the feeder. A posible solution might include relocating the feeder, unless the hornets should then find the new location. 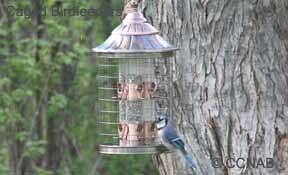 This is a style of birdfeeder that allows many options as to the design and size of the feeder. These feeders work by constantly replenishing the openings at the base of the feeder as the birds eat. 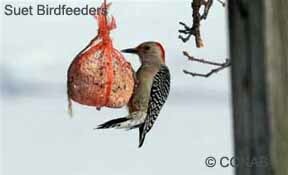 This "hopper method" works quite well and in the case in some public areas, the feeder may have a holding capacity of 20 liters or more of birdseed, which only requires refilling once a week or less. The platform birdfeeder can be supported on a post or hung on a wire. No matter the choice, precautions will have to be made to keep squirrels away. Metal sheeting on the post will make it difficult for animals to fasten their claws into the post, while flattened cones placed on the wires above the birdfeeder, prevent the animals access to the feeders from above. Platform birdfeeders can be purchased in most stores, with prices starting at reasonable rates to very expensive models. From personal observations of the many styles I have and currently use, birds tend to prefer feeding through portholes as opposed to feeding at the base of the feeders. Many times birds have been seen quarrelling over a tube feeder, when there are no birds feeding at the hopper feeder, even though both feeders have the same type of bird seed.